As it sits right now, the Toronto Maple Leafs will be selecting 17th overall at the NHL Entry Draft in a few weeks. It’s been a few years since we as Leaf fans have had to worry about prospects outside of the top-10 and with the lower pick comes a lot of uncertainty. The volatility of this year’s draft brings even more. With that said, it’s going to be very hard to pinpoint just exactly who will be available when the Leafs pick at 17 overall. There are names like Nick Suzuki, Juuso Valimaki and Timothy Liljegren that would be no-brainers if they’re available – though it’s incredibly unlikely that they drop that far. Even though they are drafting in the second half of the first round, it’s not unthinkable that the Leafs could unearth a star at #17. Last week, I took a look at the recent history of the pick, and you can get a very good player at 17 – guys like Zach Parise, Tomas Hertl and Jake Gardiner have recently been selected 17th overall. With proper scouting – something the Leafs have shown is one of their strengths – it should be expected that whoever Toronto selects in the first round will have a chance to be a significant impact in the not too distant future. With that in mind, here is my list – in order – of guys I think will realistically be available and who I would want the Leafs to pick. Poehling is a guy that isn’t getting a lot of attention as we move into draft season – likely a byproduct of where he plays. He was selected first overall in the USHL draft, but Poehling decided to fast-track and skip his senior year of high school so that he could play his draft season at St. Cloud State with his older brothers. As the youngest player in the NCAA last season, Poehling was consistently lining up against competition two, three and four years older than him – and for a tall lanky kid that still needs to mature physically, it posed a bit of a challenge. After a rough start to his season, Poehling turned things around in the second half. He is a smart hockey player with great instincts and was able to show an ability to adapt and grow in-season at a rate not usually seen by players his age. His offensive numbers weren’t exactly impressive this season, though every time he played against his age group – Ivan Hlinka and U-18 tournaments – he was the best player on his team. He is a big, rangy center that can play as a big body in front of the net or a cycle-driver behind it. With the level of growth he was able to show this season, Poehling strikes me as a guy who could be done with the NCAA before he turns 20. Center depth is a concern for the Leafs right now and the addition of a guy like Poehling to the prospect pool opens up the possibility of keeping Nylander at the wing long term – if a Nylander/Matthews dynamic duo is something Babcock decides he doesn’t want to break up. The beautiful part about having Auston Matthews is that you don’t have to draft a center expecting him to turn into a 1C. Drafting a guy like Poehling that could be a 1C on some teams, but an elite 2C on others is the perfect situation. 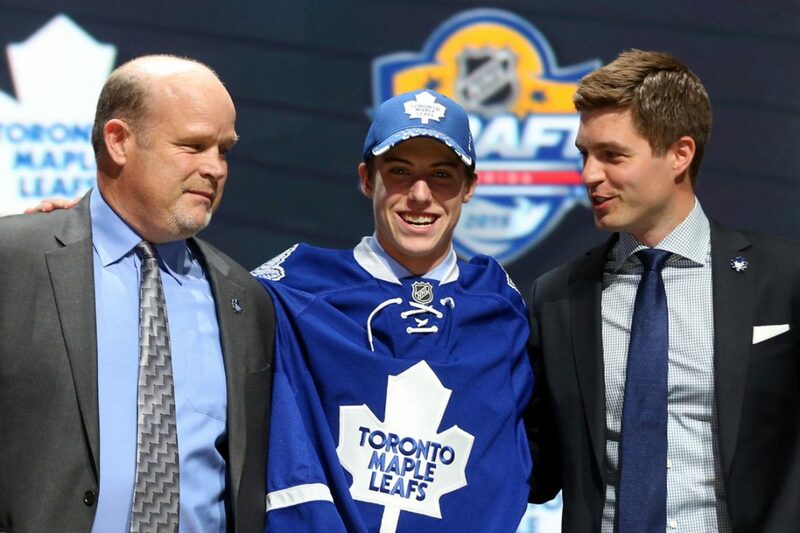 Selecting Joseph Woll and JD Greenway last season, the Leafs proved they are not afraid to draft players that are taking the NCAA path of development. What do the Leafs have an abundance of? Highly skilled wingers. That would make Yamamoto redundant right? Maybe, but when a player is as skilled as he is, you make the pick and worry about finding spots for everyone later. Kailer Yamamoto might be the single most talented player in this year’s draft. So why will he likely be available at #17? He’s 5’8 and less than 160lbs. He’s small, very small, and unfortunately size bias is still very much a factor in the NHL draft. Luckily for Leaf fans, Mark Hunter and his group of scouts have shown an ability – before last year – to value skill over size. The size bias is no more evident than when you look at Yamamoto and Michael Rasmussen. Rasmussen’s production in the same league is nowhere near that of Yamamoto, and yet he’s ranked in the same range – a fact that can be entirely chalked up to Rasmussen being 9 inches taller. Playing in Spokane, Yamamoto finished second among all draft eligible CHLers – behind only Nico Hischier – in points per game played. He is a magician with the puck on his stick and has shown that he is smart and quick enough to not let his size hinder his puck possession. Thanks to his incredible performance at the Memorial Cup this past week, Jeremey Bracco has become a favorite of many in Toronto. Yamamoto is a very similar player to Bracco with one key difference – he’s actually more talented. Yamamoto might be redundant in the Leafs system and filling other needs might be something management would like to do, but at a certain point, selecting the best player available is the best option. If Kailer Yamamoto is still on the board at 17, he’s almost certainly going to be the best player available. Vesalianen is a bit of a risky pick, but the potential is there that he could be an absolute home run at 17. The Finnish left-winger has fallen out of favour with some due to a lack of production this season. The thing is, that perceived lack of production isn’t anything out of the ordinary for a top player of his age playing in the SHL. Very few players spend their U-18 season in the SHL. The biggest knock on Vesalainen has been consistency and drive. He has the skill to be a dominant power left-winger in the NHL and it seems that he needs the right kind of coach to draw that out of him on a consistent basis – something tells me Mike Babcock is that kind of coach. With JVRs future in Toronto very much in flux, having a high-end left wing prospect in the system would be a great thing – especially one with top line game-breaking talent like Vesalianen. Brannstrom is one of the prospects that has a lot of hype attached to his name these days. Maybe it’s the fact that he dominated the Swedish U20 league this season, maybe it’s the fact that he was one of the best defensemen in the U18 tournament, or maybe it’s the fact that we all sat in amazement watching a Swedish puck-moving defender in this yer’s NHL playoffs. He is a great skater and is the kind of defender you want to have the puck on his stick. He plays with a poise and calmness not usually seen by a junior aged player and he has the potential to turn into an elite puck-mover in the NHL. Despite his size, he is very strong and has no problem separating opponents from the puck. When a defenseman is known as an undersized puck mover, you usually worry about how he plays in his own end – that isn’t a big concern with Brannstrom. The Leafs need defensive prospects, you’d prefer a right-handed shot, but regardless of the side he plays on, Brannstrom would instantly become the best defensive prospect the Leafs have had in a while. On the other end of the spectrum, you have Nic Hague – unlike with Brannstrom, size is definitely not an issue. Hague is 6’6, 215lbs and already looks like an NHL defender. Unlike others his size, Hague is a great skater with a strong stride and the ability to get around the ice quickly. He’s big, but he’s far more than a shutdown defender. Hague already has an NHL-caliber shot and has the potential to be one of the most lethal weapons from the blueline on any NHL powerplay. In his own end, Hague is able to use his size to close gaps and cause separation from forecheckers. His biggest defensive weakness is when he has to deal with quick opponents one on one in the neutral zone. He needs to work on his footwork in order to better transition off the rush. Hague has all the physical tools necessary to be a top pairing defenseman in the NHL, the issue is between his ear. He has to learn to play with more discipline and seems to lack the natural instincts you’d like to see from a high-end defender. Playing in Mississauga, it’s safe to assume the Leafs have a very good handle on Hague as a prospect – all of Lou, Mark Hunter and Brandon Pridham were seen in the building more than once during the Steelheads playoff run. Foote, like Hague is a guy that you’ll never have to worry about his size and strength on an NHL blueline. He’s the right-handed shot that the Leafs need. He is a guy that has fallen out of favor with some as the season has gone along. Once seen as a top-10 pick, the 6’3 rearguard is going to make someone drafting in the second half of the first round very happy. He might not have the elite ceiling of others, but it’s not hard to picture Foote on the right side of a second pair for the Leafs in a few years. This might seem a little high for Thomas to be drafted, but I have asked around over the past week and a handful of people in the OHL have mentioned his name in relation to the Leafs. The connection with Mark Hunter is obvious, but there’s more to it than that. Thomas is a very young player that got significantly better as his season went on. He is a smart kid that is expected to get a lot of love at the draft combine this week and for a guy who was once seen as a mid-second round pick, drafting Thomas at 17 might not be out of the question. Thomas is a very skilled, very smart playmaking center. His 34 primary assists were enough to be top-10 in the OHL this season and the total probably could have been a lot higher if he were playing on a more offensively talented line – his most common linemates this season were JJ Piccinich and Sam Miletic. He is a guy that didn’t rely on the powerplay to add stats – 72% of his points came at 5v5. He is a very unassuming player both on and off the ice. For the most part, he plays a quiet and steady game but every now and then you’ll see a flash of something that makes you think he could be a top point producer in the OHL as early as next season. Thomas is an all-around center that plays a very good 200-foot game. He’s the kind of center you like to have in that he can play in multiple roles. He’ll kill penalties but can also fill in on your top offensive line when need be. I’m not a fan of attaching NHL names to prospects, but if you were to compare Thomas to Bo Horvat, you wouldn’t be too far off. He won’t be 18 until after the draft, so if you subscribe to the “late birth-date theory”, Thomas is a good pick with more room to grow than many of his peers. He has the speed and creativity that has become a calling card of the Leafs lineup and he’d be the kind of player that could likely step right into the lineup in his draft+2 season and contribute on an ELC when the big-money extensions for Matthews, Nylander, and Marner are on the books. It might be high, and the Leafs might be able to trade down to select Thomas, but if he’s the guy Hunter and crew want, don’t be surprised if they pull the trigger at #17. Previous 2017 NHL Entry Draft: Who Could the Ottawa Senators Draft with Each of Their Picks? Next 2017 NHL Entry Draft: Who Could the Montreal Canadiens Select with Each Pick?